President Trump's ban on immigration by citizens from seven Muslim-majority countries ran into at least a temporary roadblock Saturday night, after a U.S. District judge in Brooklyn granted an emergency stay sought by immigrants' rights lawyers. President Trump’s ban on immigration by citizens from seven Muslim-majority countries ran into at least a temporary roadblock Saturday night, after a U.S. District judge in Brooklyn granted an emergency stay sought by immigrants’ rights lawyers. The judge’s ruling applies to those who have already arrived in the U.S. and those who are in transit who hold valid visas. The decision halts part of Trump’s executive order, which barred citizens from those seven countries for the next 90 days. Trump’s executive order, signed Friday, suspends the entry of all refugees to the U.S. for 120 days, halts admission of refugees from Syria indefinitely and bars entry for three months to residents from the predominantly Muslim countries of Iraq, Syria, Iran, Sudan, Libya, Somalia and Yemen. The fallout from the temporary ban struck with full force Saturday, blocking some travelers from boarding their planes overseas, compelling others to turn around upon arrival in the U.S., and prompting customs agents at New York's JFK Airport to detain at least a dozen people, including a former Iraqi translator for the U.S. military in Baghdad. The growing chaos also sparked legal challenges, airport protests, condemnations from politicians and denunciations from advocacy groups. The ACLU and other legal groups filed a lawsuit in reaction to the ban earlier in the day. New York Gov. Andrew Cuomo Saturday tweeted an offer of support to those who had been stopped at the state's airports: "I have directed Port Authority, @NYSDOS, & my Counsel's Office to jointly explore all legal options to assist anyone detained at NY airports." Cuomo's tweet linked to a statement in which he objected to refugees being blocked from entering the U.S.
"I never thought I'd see the day when refugees, who have fled war-torn countries in search of a better life, would be turned away from our doorstep. We are a nation of bridges, not walls, and a great many of us still believe in the words 'give me your tired, your poor, your huddled masses …' " he wrote. "This is not who we are, not who we should be." The reverberations began only hours after Trump signed the executive order Friday that suspends the entry of all refugees to the United States for 120 days, halts the admission of refugees from Syria indefinitely and bars entry for three months to residents from the predominantly Muslim countries of Iraq, Syria, Iran, Sudan, Libya, Somalia and Yemen. In brief remarks while signing his latest executive orders Saturday, Trump maintained the order isn't a "Muslim ban." “It’s working out very nicely. We’re going to have a strict ban, and we’re going to have extreme vetting, which we should have had in this country for many years," he said. The ban includes green card holders, who will need a case-by-case waiver to return to the United States, a senior administration official said in a White House briefing Saturday. Green card holders already in the U.S. will need to meet with a consular officer before leaving the country, according to the official, who declined to be identified under the rules of the briefing. 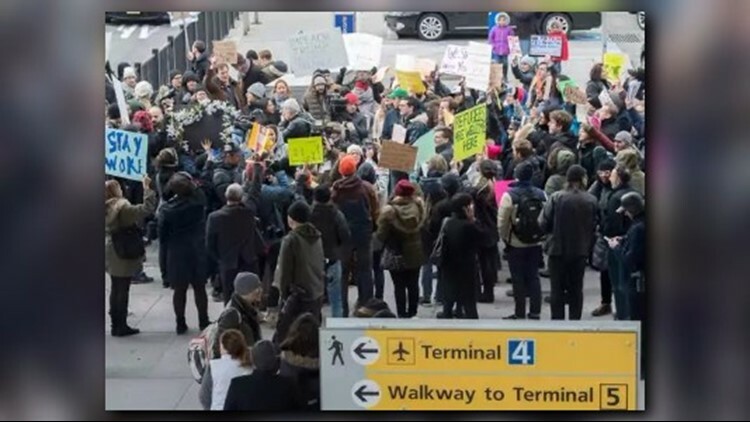 Speaking to hundreds of demonstrators at JFK Airport, Rep. Jerrold Nadler, D-N.Y., called the ban ineffective, discriminatory, "disgusting," and said it "goes against every ounce of our traditions from George Washington onward." "We are here to say it should be stopped and be revoked," he said. At Washington's Dulles International Airport, where a protest was mounted, Gov. Terry McAuliffe and Virginia Attorney General Mark Herring said the state was considering taking legal action to challenge the ban. About 50 people were detained at Dallas-Fort Worth International Airport, said Alia Salem, executive director for DFW Chapter of the Council on American-Islamic Relations (CAIR). Families have been waiting at Terminal D in anticipation of meeting relatives who been held up in U.S Customs. A representative with CAIR met with families waiting for relatives. Some of them have been waiting for several hours. At Philadelphia International Airport, two Syrian families, described as Christians, were briefly detained Saturday after arriving from Qatar and sent back three hours later. The families included two brothers, their wives and two children, according to a family member form Allentown, Pa., NBC10 reported. "This is like a nightmare come true," said Joseph Assali, who noted that the families had visas and green cards legally obtained months ago. Mohammed Al Rawi, chief information officer for Los Angeles County, said on Facebook that his father was removed from a flight in Qatar as a direct result of the order. "My 71 year old dad is in Qatar boarding LAX flight to come visit us and and he's being sent back to Iraq. Some US official told him that Trump canceled all visas," he wrote. Foreigners studying at U.S. universities who were part of study abroad programs were also stuck. Even Customs and Border Protection agents were confused about how to handle Trump’s order and responding in different ways, he said. Those holding dual nationality in the seven nations involved in the ban will also be barred from entering the United States, the Wall Street Journal reported citing a statement from the State Department that has yet to be released. In Cairo, seven migrants — six from Iraq and one from Yemen — were being escorted by officials from the U.N. refugee agency when they were stopped from boarding the EgyptAir plane, the Associated Press reported, quoting Cairo airport officials. The authorities stepped in after contacting their counterparts at JFK Airport, where the plane was headed. The officials spoke to AP on condition of anonymity because they were not authorized to brief the media. Only one of the 12 picked up at JFK Airport was freed by Saturday afternoon. Hameed Khaldi Darweesh, who worked a translator for American forces for 10 years, had been detained overnight following his arrival from Istanbul. He said he had feared he would be sent back to Iraq, which his family fled because of death threats. Among the 11 still being held at the airport was another Iraqi refugee, Haider Sameer Abdulkhaleq Alshawi, who was trying to join his wife and child. His wife worked for a U.S. contractor in Iraq as an accountant, was granted a refugee visa and is now living in Houston. Alshawi was approved for a visa to join his wife and their 7-year-old son on Jan. 11. According to a federal complaint filed on behalf of two Iraqis being held at JFK airport, one attorney approached Customs and Border Patrol agents with a request to speak to his client, but was told they were not the ones to talk to about seeing him. "Who is the person to talk to?" the lawyer asked, according to the complaint. The unidentified CBP agents responded: "Mr. President. Call Mr. Trump." According to one of the lawyers, Mark Doss, the pair had been approved for entry as refugees but were in the air flying to the U.S. night when the order was being signed. U.S. Customs and Border protection was working to provide waivers for the two Iraqis involved in the lawsuit, according to the official at the White House briefing. Abed Ayoud, legal and policy director for the American-Arab Anti-Discrimination Committee, said they’ve received more than 1,000 calls by midday Saturday from people who have been stranded or detained in the U.S. and abroad. He said legal immigrants traveling overseas to attend funerals and visit family when the president signed his order are now unable to return to the U.S. In Tehran, Iran's foreign minister, Javad Zarif, said his country would respond by banning all U.S. citizens from the country as long as the U.S. policy was in effect, but would not include anyone who already received a visa. In a statement, the foreign ministry called the U.S. order "a clear insult to the Islamic world, and especially to the great nation of Iran." In signing the executive order, Trump said the new administration needed time to develop a stricter screening process for refugees, immigrants and visitors. "I'm establishing new vetting measures to keep radical Islamic terrorists out of the United States of America. Don't want them here," he said. The executive order, which he said was aimed at protecting Americans from terrorist attacks, singled out Syrian refugees as "detrimental to the interests of the United States." When the refugee program resumes, the executive order calls for changes to "prioritize refugee claims made by individuals on the basis of religious-based persecution, provided that the religion of the individual is a minority religion in the individual's country of nationality." "We only want to admit those into our country who will support our country and love deeply our people," Trump said. CAIR said it will file a federal lawsuit Monday in the Eastern District of Virginia to challenge the constitutionality of the order, charging its apparent purpose and underlying motive is to ban people of the Islamic faith from Muslim-majority countries from entering the United States. Marielena Hincapié, executive director of the National Immigration Law Center, one of the groups representing the Iraqi men detained at JFK, said the lawsuit is directed solely at immigrants who have been caught in legal limbo following Trump’s announcement. The lawyers are trying to expand it into a class action suit to cover the untold number of refugees caught in the same situation. Hincapié said they are planning separate lawsuits challenging the legality of Trump’s executive actions on immigration, partly because they target majority Muslim nations. But she said for now, they simply want to resolve the cases of people who are being detained at airports. They are trying to get an emergency hearing before a judge this weekend.